You can change the look of a line shape by changing its color, line style, or weight. You can also apply a predefined Quick Style to quickly change the look of your line. Note: A line shape is a line inserted by clicking the Shapes button on the Insert tab. For more about inserting lines, see Add shapes. Quick Styles for lines include theme colors from the document theme, shadows, line styles, gradients, and three-dimensional (3-D) perspectives. Try different Quick Styles until you find one that you like. If you want to change multiple lines, select the first line, and then press and hold while you select the other lines. Click the Shape Format tab, and then click the Quick Style you want for the line. To see more Quick Styles, click the arrow at the bottom of the Quick Style gallery. Note: If you don't see the Shape Format tab, make sure you've selected the line. 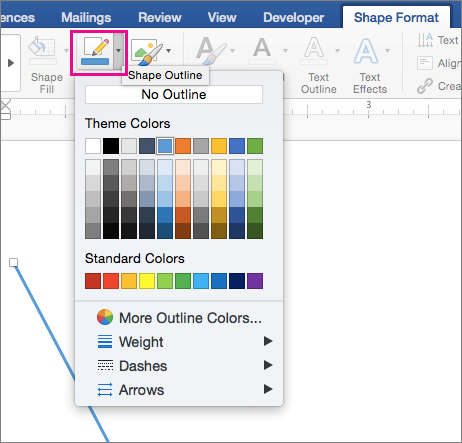 Click the Shape Format tab, click the arrow next to Shape Outline, and then click the color that you want. To use a color that isn't a theme color, click More Outline Colors, and then click the color you want. You can also mix your own color using the color wheel or the color palettes. Custom colors are not updated if you later change the document theme. Click the Shape Format tab, click the arrow next to Shape Outline, point to Dashes, and then click the style you want. Click the Shape Format tab, click the arrow next to Shape Outline, point to Weight, and then click the line weight that you want. 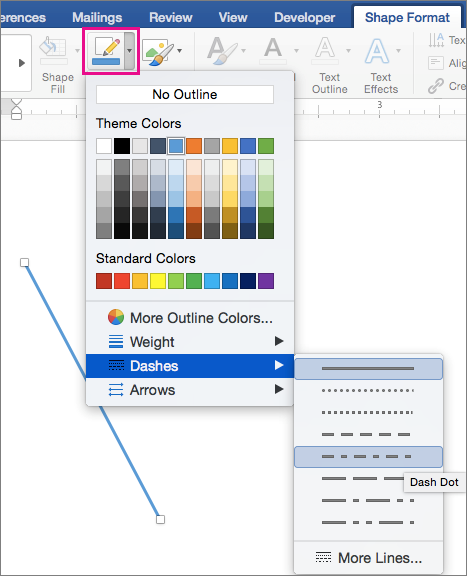 In your document, hold down the mouse button and draw the line where you want. Tip: To draw a line at a pre-set angle, such as vertical or horizontal, hold down SHIFT as you draw the line. Click the line that you want to change, and then click the Format tab. Under Shape Styles, click the arrow next to Line , and then click the color that you want. Under Shape Styles, click the arrow next to Line , point to Weights, and then click the width that you want. Under Shape Styles, click the arrow next to Line , point to Arrows, and then click the arrow that you want. On the Home tab, under Insert, click Shape, point to Lines and Connectors, and then click Scribble . Click the line that you want to delete, and then on the Standard toolbar, click Cut .